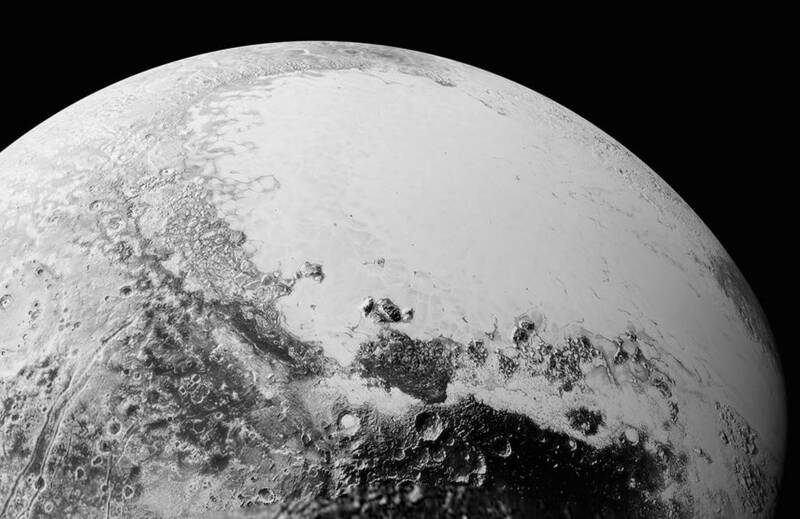 September 10, 2015 – New close-up images of Pluto from NASA’s New Horizons spacecraft reveal a bewildering variety of surface features that have scientists reeling because of their range and complexity. New Horizons began its yearlong download of new images and other data over the Labor Day weekend. Images downlinked in the past few days have more than doubled the amount of Pluto’s surface seen at resolutions as good as 400 meters (440 yards) per pixel. They reveal new features as diverse as possible dunes, nitrogen ice flows that apparently oozed out of mountainous regions onto plains, and even networks of valleys that may have been carved by material flowing over Pluto’s surface. They also show large regions that display chaotically jumbled mountains reminiscent of disrupted terrains on Jupiter’s icy moon Europa. 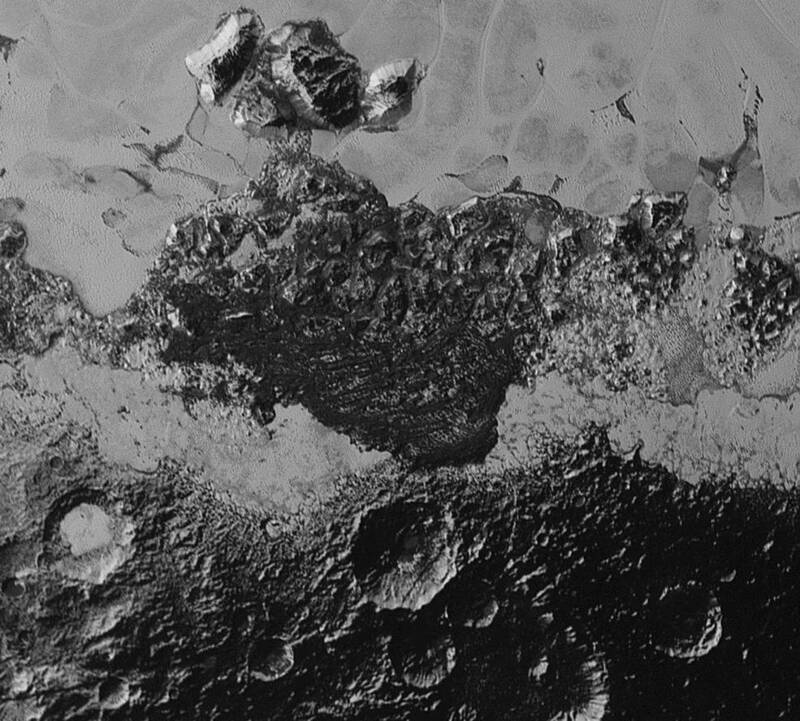 New images also show the most heavily cratered — and thus oldest — terrain yet seen by New Horizons on Pluto next to the youngest, most crater-free icy plains. There might even be a field of dark wind-blown dunes, among other possibilities. 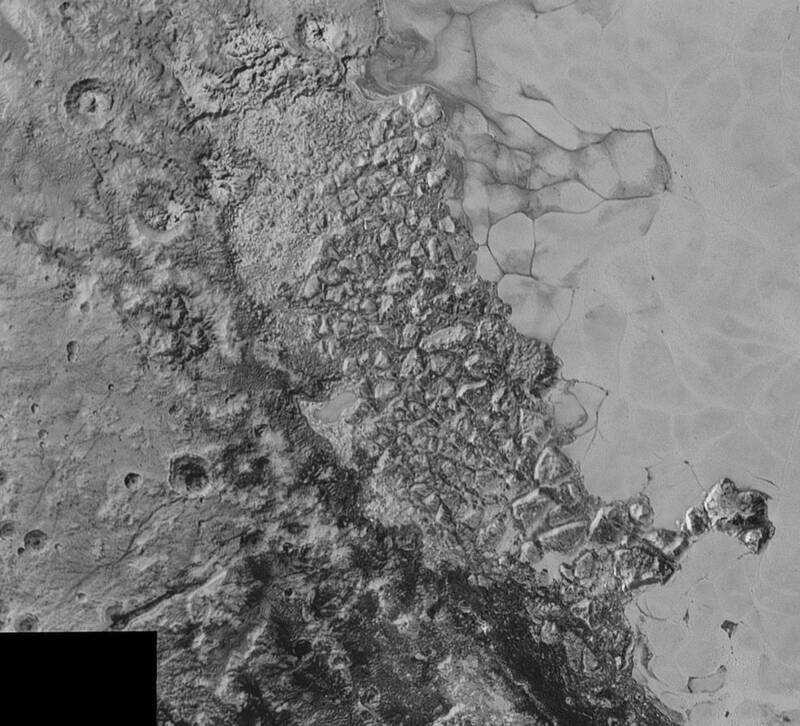 Discoveries being made from the new imagery are not limited to Pluto’s surface. 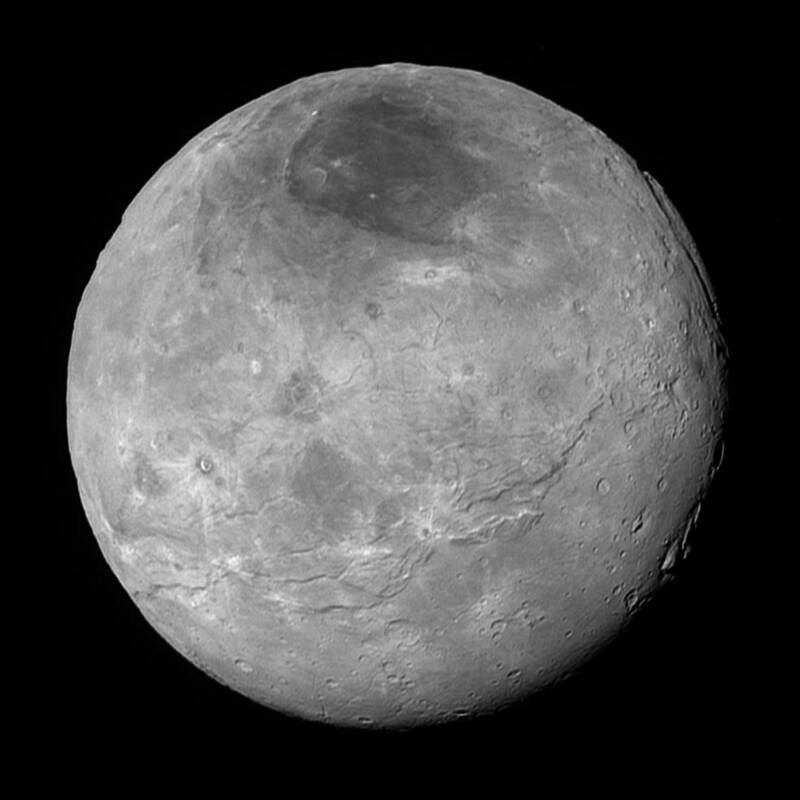 Better images of Pluto’s moons Charon, Nix, and Hydra will be released Friday at the raw images site for New Horizons’ Long Range Reconnaissance Imager (LORRI), revealing that each moon is unique and that big moon Charon’s geological past was a tortured one. 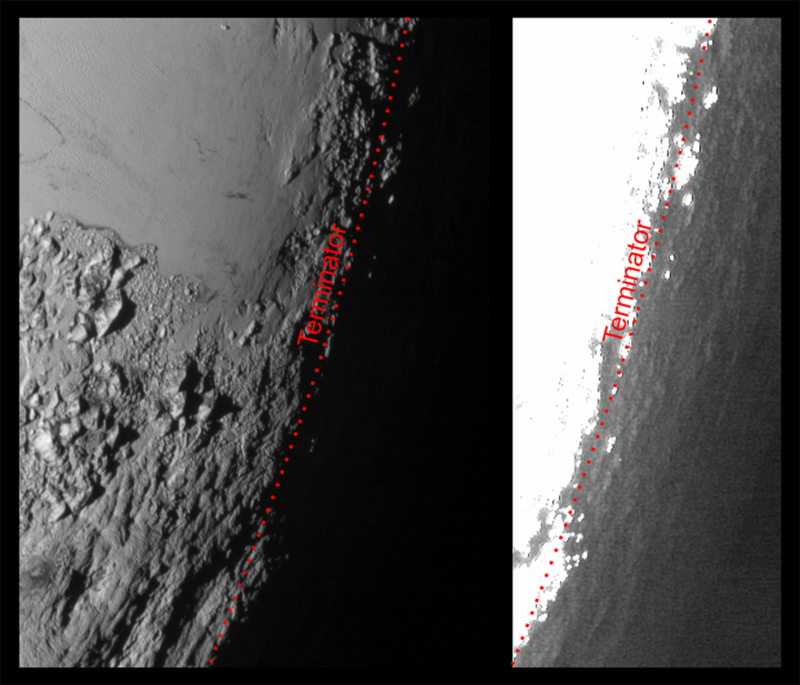 Images returned in the past days have also revealed that Pluto’s global atmospheric haze has many more layers than scientists realized, and that the haze actually creates a twilight effect that softly illuminates nightside terrain near sunset, making them visible to the cameras aboard New Horizons. 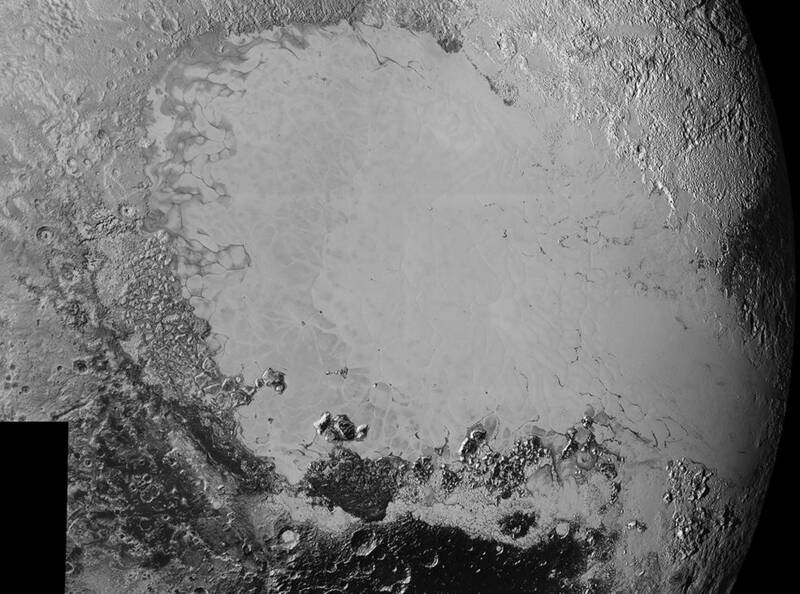 In the center of this 300-mile (470-kilometer) wide image of Pluto from NASA’s New Horizons spacecraft is a large region of jumbled, broken terrain on the northwestern edge of the vast, icy plain informally called Sputnik Planum, to the right. The smallest visible features are 0.5 miles (0.8 kilometers) in size. This image was taken as New Horizons flew past Pluto on July 14, 2015, from a distance of 50,000 miles (80,000 kilometers). The New Horizons spacecraft is now more than 3 billion miles (about 5 billion kilometers) from Earth, and more than 43 million miles (69 million kilometers) beyond Pluto. The spacecraft is healthy and all systems are operating normally. New Horizons is part of NASA’s New Frontiers Program, managed by the agency’s Marshall Space Flight Center in Huntsville, Alabama. The Johns Hopkins University Applied Physics Laboratory in Laurel, Maryland, designed, built, and operates the New Horizons spacecraft and manages the mission for NASA’s Science Mission Directorate. SwRI leads the science mission, payload operations, and encounter science planning. Ball Aerospace and LASP also contributed to the mission.